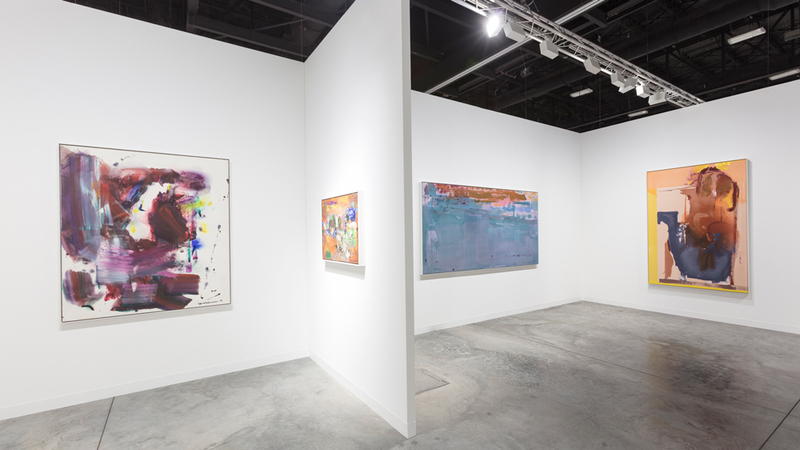 The 16th edition of Art Basel Miami Beach, America’s premier international art fair for contemporary art, boasts a roster of 268 galleries representing some 32 countries. We know your time is valuable, so Robb Report has chosen the 5 must-see, standout stands at this month’s event, which runs through December 10. If your time is limited, stop at these 5 first. The New York gallerist has devoted the major portion of his booth to presenting esteemed women artists in a fraternal context: the iconic Mexican painter Frida Kahlo is represented with a rare and fantastic object, Frida’s Plaster Body Cast with Hammer & Sickle and Unborn Baby (circa 1950), a hand painted body cast the artist completed while hospitalized. 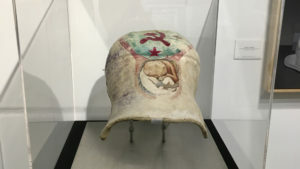 She used a mirror to paint the image of the unborn baby and the Communist symbol on the cast, which she wore as a result of severe back injuries, incurred in her youth. It is priced at $2.8 million. 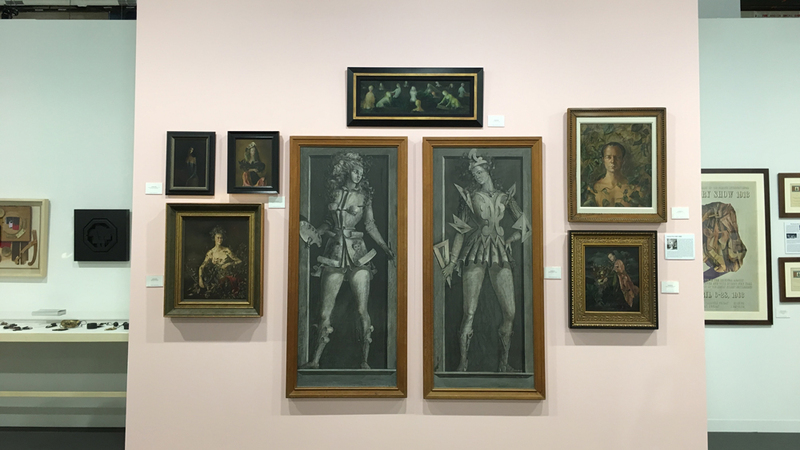 Naumann also displayed eight paintings by the Surrealist artist Leonor Fini, including Portrait of Mrs. Hasellter (1942), depicting the famed tennis player with half of her face shown as an old woman and the other half in her prime. The commission was rejected and Fini kept it in her collection for decades. Naumann is also offering La Peinture et l’Architecture (1938-39), a pair of works by Fini executed in oil on panel and fitted onto custom-made doors that were actually used by the storied art dealer Leo Castelli when he opened his first gallery in Paris. The diptych carries a price tag of $1 million. Naumann also presented small-scale sculptures and handcrafted jewelry by Louise Nevelson and a stunning Dorothea Tanning pencil on paper, Solitary (1973). The seasoned Chicago/New York gallerist staged three major paintings and a single bronze sculpture by the abstract expressionist master Willem de Kooning and sited in the impressive company of pieces by Mark di Suvero, David Smith, Isamu Noguchi, and Alexander Calder. 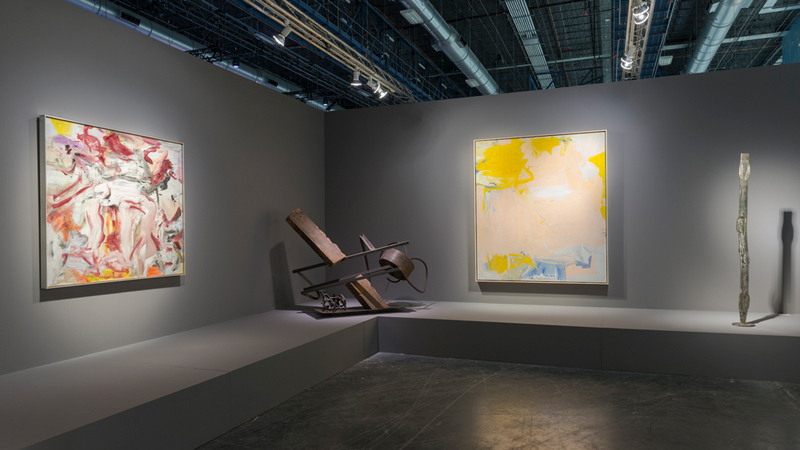 The rare chance to see such great de Kooning works, including East Hampton IV (1977), priced at $9.5 million and the larger Untitled VII (1979) bearing a $35 million price tag, makes art fair viewing experience richer even if you’re just tire kicking the goods. The third de Kooning painting, the ravishing abstract landscape, Untitled (1961) and scaled at a mighty 80 by 70 inches, was on loan from a private collector who acquired it at a Christie’s New York auction in May 2006 from the vaunted collection of Virginia Dwan for $10.1 million. In striking, wall-hugging fashion, the revered New York gallery presented Minimalist master Sol Lewitt’s 100 Cubes, comprised of, yes you can count them, 100 numbered gouache-on-paper geometric compositions completed in 1991. The work has been sold to a public collection in Europe for $1 million to $1.5 million range. The visual impact of the presentation was especially dramatic, given the position of the gallery’s stand as you entered the art fair. Lewitt’s work was complemented by the conceptual artist Charles Gaines’ Number and trees Central Park Series IV, painted on a plexiglass panel (2015-16). 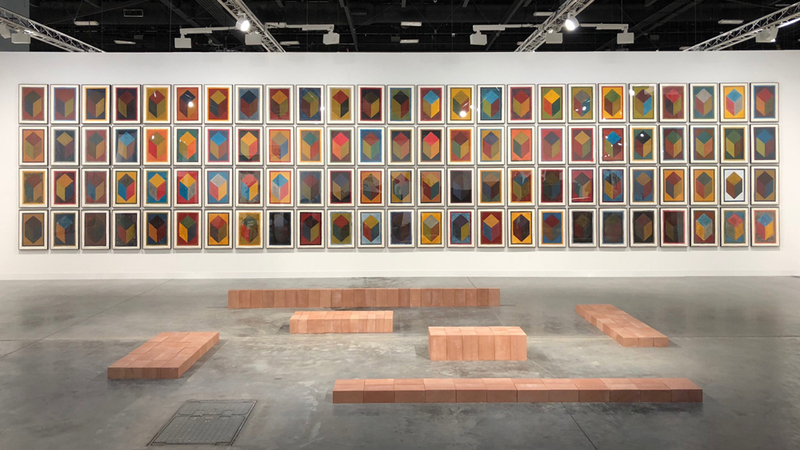 It sold for around $200,000, its presentation at the fair all the more impressive as other works from his acclaimed series are currently on view at Miami’s Institute of Contemporary Art. The stand also had floor-sited works by Carl Andre from 1998 that added further gravitas to the installation. The 51-year-old Johannesburg/Capetown Gallery staged a searing political and social justice themed grouping with two major light box works by Chilean artist Alfredo Jarr, Gold in the Morning C and Gold in the Morning B from 1986. 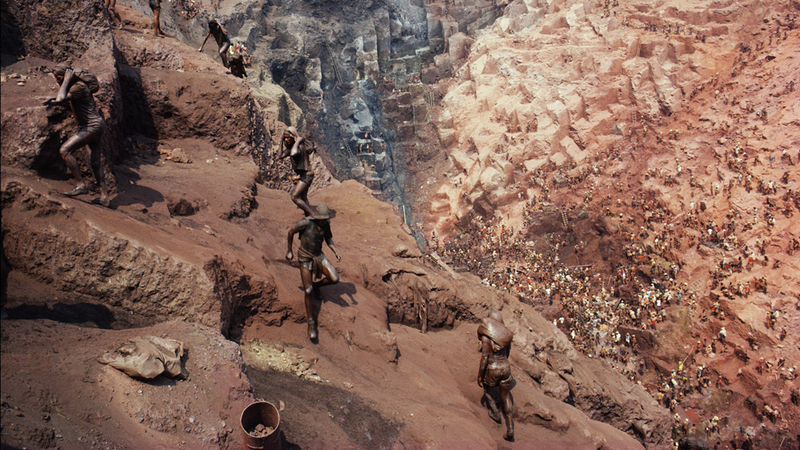 The color transparencies within the light boxes capture the slave-like conditions of African gold miners, spread out like laboring ants, in a giant excavation. The gallery also presented two brilliant works by William Kentridge, a large-scale piece on butcher paper, Drawing from “The Refusal of Time” (La Negation du temps) (Man with a Drum) (2010-11), in poster paint, charcoal, and colored pencil on brown paper. It featured a man bearing a sandwich board with the words “Anti-Mercator” drawn on the sign. The second Kentridge is a unique sculpture, redolent with the kinetic influences of Jean Tinguely and Marcel Duchamp. Titled Kinetic Sculpture (Bicycle Wheel) (2016) it is executed in wood, metal, and found objects, and even makes its own sound track when you turn the found bicycle part pedals. Goodman also debuted the wildly figurative work of the Zimbabwe artist Misheck Masamvu, The Smell of Driftwood in oil on canvas. Goodman would have had more examples of Kentridge and other gallery artists but a shipping snafu kept some of the Miami bound work stuck in transit. 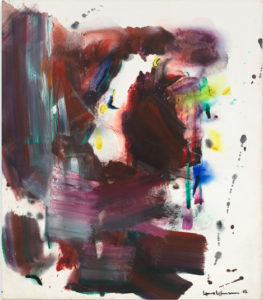 The Chelsea-based gallery staged a mini-museum like survey of the abstract expressionist painter and teacher Hans Hofmann with seven works dating from 1940 to 1965. Collectively, they impressively show the wide and always experimenting range of Hofmann’s practice, and hard to miss with its vivid palette and fluidity of line. One of those color-charged and incredibly fresh looking compositions, Phantasmagoria (1964), scaled at 60 by 52 inches was priced at $650,000. One could go on with further favorites and deeper lists—a good indication of the visual riches on hand at Art Basel Miami Beach. The fair closes on Sunday December 10. This entry was posted in Art Fairs and tagged Alexander Calder, Alfredo Jarr, Ameringer Mcenery Yohe, Art Basel Miami Beach, Charles Gaines, David Smith, Francis Naumann Gallery, Frida Kahlo, Goodman Gallery, Isamu Noguchi, Leonor Fini, Mark di Suvero, Paula Cooper, Richard Gray Gallery, Sol LeWitt, Willem de Kooning. Bookmark the permalink.